Anca Cherecheș, a Cornell graduate student in Linguistics, gives stinkhorns a good name. I don’t think the poor stinkhorn realizes just how polarizing it is. But it’s not hard to see why it produces strong, often visceral reactions. Just look at it. To be perfectly frank, what I see is a male sexual organ, dipped in excrement, with a mesh skirt. Some people (possibly focusing on the skirt) describe it as “amazing” and “beautiful,”1 while others will only see it as “gross” or “scary,”2 which probably explains why its common names range from the sweet-sounding “veiled lady” to the pragmatic “basket stinkhorn.” In professional circles, it’s known as Phallus indusiatus,3 where indusium (Latin for “outer tunic”) is the technical term for a kind of membrane and in this case refers to the skirt-like structure, and phallus… well, I suppose mycologists call it as they see it. All in all, this is one mushroom that doesn’t look all that appetizing, and I haven’t even yet mentioned its number one cardinal sin: like any true stinkhorn, the thing stinks. Or, to be more precise, its cap is covered by a slimy, smelly, sticky substance called the gleba. The gleba stinks so bad that mycologist David Arora, in his Mushrooms Demystified field guide, devotes an entire paragraph to the various epithets people have used to describe the stinkhorn odor. Think “putrid” and “garbageous,” but also “like the damp earthy smell we meet with in some of our churches on Sundays.”4 Of course, that’s exactly how flies like it; they’re attracted to the rotten smell of the spore-containing gleba and inadvertently help the stinkhorn disperse its spores. Stinkhorns are too disgusting to eat […]. Nevertheless, people have tried eating the cooked eggs of some species after removing the slime layer. I reluctantly tried one bite of a cooked stinkhorn egg just once, so I could speak about the experience first-hand. I noticed very little flavor and a markedly unpleasant texture before I spit it out! […] I added [dried mature stinkhorn] to a soup, and found it to have no flavor, and a weird squishy texture that people in China apparently like, but I found very unpleasant. In the West, therefore, stinkhorns are generally avoided. But in East Asia, the pendulum swings the other way: one stinkhorn species, the same Phallus indusiatus as in the picture above, has been collected for centuries as a choice edible reserved for special occasions and, since 1979 when it was first successfully cultivated in Southwest China, it has become more widely available, but no less treasured.6 Phallus indusiatus grows in tropical regions around the world, including parts of Central and South America and Africa. In Asia it is consumed not just in egg form, as North American field guides suggest, but also in mature form. In fact, it is in this latter, mature state that you are likely to find it at major or well-stocked Asian grocery stores and markets, in the dried fungus section. 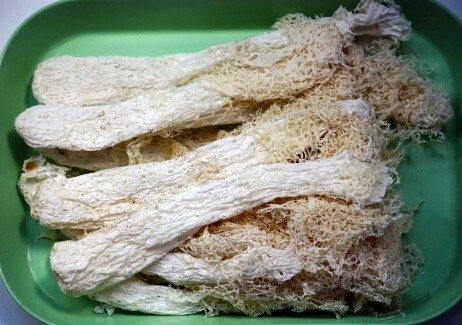 Phallus indusiatus is usually sold dried, without the smelly pileus or the tough volva, under the common name bamboo fungus or bamboo pith fungus (simplified Chinese: 竹荪; traditional Chinese: 竹蓀; pinyin: zhúsūn). 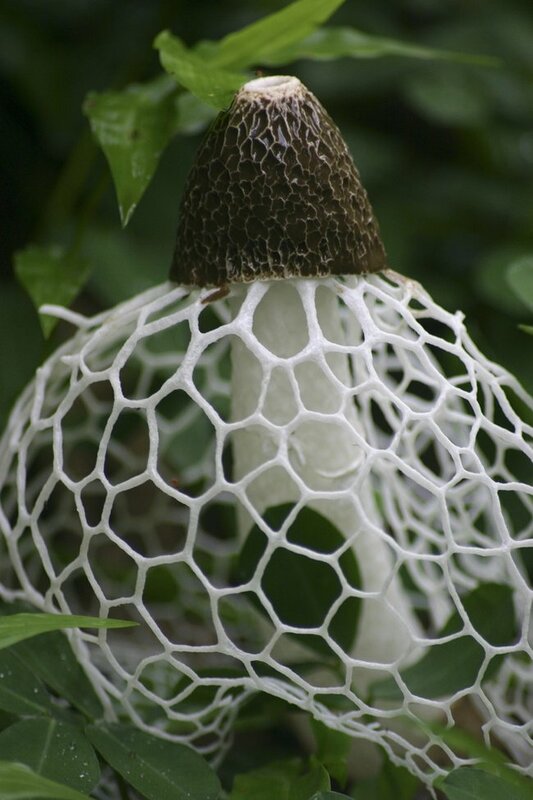 The West’s basket stinkhorn is the East’s bamboo fungus. [Editor’s Note: At least three stinkhorns have been cultivated in China, including Phallus rubrivolvatus and Phallus fragrans. It is unclear to me whether bamboo fungus is a true Phallus indusiatus or a different Phallus species]. In the name of science (and gastronomy), I procured a packet of dried bamboo fungus from an online Asian grocer. The mushrooms arrived intact, but they are very fragile, which is not surprising given the open, spongy structure of the stalk and the thin mesh-like skirt. This is in fact one of the reasons why bamboo fungus is not sold fresh: it is crisp and easy to break, thus difficult to transport. My packet of dried fungus had a rather persistent smell: earthy and mushroomy, but with a strong hint of musty hay and almonds. It lingered on my fingers after handling, but it was not unpleasant, it did not overwhelm my kitchen and it mellowed down significantly after soaking. I rehydrated my mushrooms in cold water for a few hours. Different people rehydrate in different ways. Some recommend warm or hot water for faster rehydration, some believe cold water preserves more of the taste; some recipes advise you to soak overnight, while others state that a few minutes are enough. Either way, the rehydrated mushrooms are not rubbery and tough like rehydrated fleshy mushrooms (e.g. shiitakes); they are flexible, but strong enough that at least the stalk can be simmered in a soup for at least an hour without it breaking apart. Recipes vary in this regard as well; some will have you cook the mushroom for a few minutes, others will ask you to keep cooking it for an hour to extract more of the flavor. So what about the taste? I side with my Chinese informants here; after simmering them in some homemade chicken stock for about 15 minutes, my stinkhorn stalks and skirts had a pleasant, mild sweetness. While they were not as “mushroomy-tasting” as their fleshier counterparts, they did pack a good punch of umami. But it is really for their texture that they are most prized in Chinese cuisine.9 The texture was indeed very interesting: smooth, silky, but at the same time subtly crunchy. This reminds some people of tripe or squid,10 but the bamboo fungus stalks are softer and more flexible than these, and the skirt is very delicate. Bamboo fungus is traditionally used in rich chicken soups,11 but you can also find it in hot pots, stir fries and stuffed. Google will find a few recipes in English, some of which I’ve collected below. Most English-language cookbooks do not mention it, but a Google Books search suggests that more recent cookbooks and some travel guides are more likely to contain a passing reference and a recipe or two. Commercially-grown Phallus indusiatus is going strong in East Asia; there is a clear market for it and it is only likely to become more well-known and widely used. In the West, though, it seems unlikely that it will replace the harmless button mushroom in the hearts and stomachs of the American public. But in the meantime, if you’re an adventurous eater and a mushroom lover, this is one relatively easy to obtain mushroom that tastes much better than it looks. So don’t judge it by its cover. If you are one of these people, you might enjoy this BBC time lapse which features a growing veiled stinkhorn. Personally, the skirt gives me a mild case of trypophobia, and I suspect I’m not the only one, since others describe it as “uncomfortable” and “weirdly discomforting” (witness this Reddit thread). Some people classify it as part of a different genus: Dictyophora. Arora. Mushrooms Demystified, p. 765. Davidson does mention that at least one species of Dictyophora, presumably our Phallus indusiatus, is sold dried in China and Hong Kong, but he goes no further. Chang & Miles, Mushrooms. Cultivation, Nutritional value, medicinal effect and environmental impact: p. 343. Id. Note, however, that the price depends on the quality. Dried bamboo fungus is divided into 4 grades according to size, color, and amount of breakage, where the first and highest grade can cost twice as much as the fourth, lowest grade. “Wildman” Steve Brill on his blog and to a lesser extent Larry Evans on Fungal Jungal, the Western Montana Mycological Association website. Chang & Miles, p. 345. Steve Brill, id. ; Eddie Lin (quoting editor Randy Clemens), Hair Moss, Bamboo Fungus, and More Lucky Foods to Eat for Chinese New Year, in: Los Angeles Magazine, February 6th 2013, retrieved online on Oct. 28th 2014, url. Dunlop, Sichuan Cookery: p. lxii. Images of a wild cousin of cultivated Dictyophora indusiata in Costa Rica, by Brian Gatwicke (Creative Commons License); of cultivated Chinese bamboo mushroom from AliExpress; and of the dried fungus by Ken Fletcher via wikimedia.org (color-adjusted). You might also enjoy Gary Lincoff’s photos of P. rubrivolvata from his China tour in 1983. Teresa Chen. 2009. A Tradition of Soup: Flavors from China’s Pearl River Delta. North Atlantic Books. Fuchsia Dunlop. 2003. Sichuan Cookery. Penguin Books. WOW! Thanks! My first introduction to veiled Stinkhorns was an image of Dictyphora multicolor on the cover of Steven L. Stephenson’ book “The Kingdom Fungi”. Was boggled then, am more boggled now. To paraphrase a well known comment, I feel compelled to say, “It takes a Planet” and that it’s probably good that these ‘shrooms can be cultivated as that may save some wild habitat. GREAT article! Really well-written and entertaining!